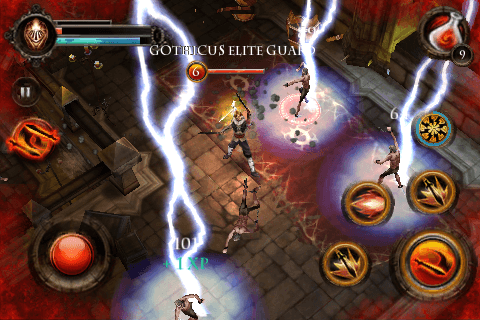 Today I had the pleasure of sitting down and testing a close to final beta build of the long awaited sequel to Gameloft’s hack and slash Diablo style RPG : Dungeon Hunter. 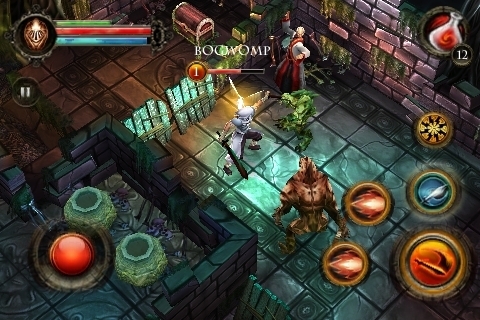 Dungeon Hunter 2 takes place 25 years after the events of the first Dungeon Hunter. You take on the role of one of the Immortal king’s twin sons and embark on a journey that has you escaping from prison and then traveling across the realm of Gothicus to save everything that needs to be saved. 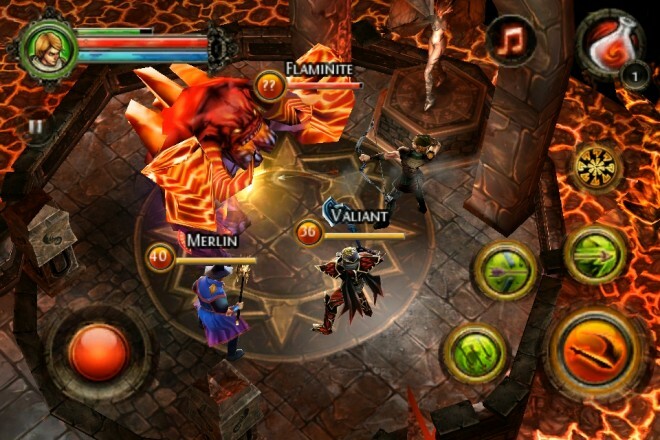 Dungeon Hunter 2 has received quite a few updates from the original release – for starters Gameloft have ramped up the graphical aspect of the game. Taking advantage of the iPhone 4 retina display, images appear vibrant, sharper and much more detailed, take for example the first level (Prison Break) the ground looks absolutely stunning making you feel guilty that you’re walking around with those dirty boots on messing up the place. Along with that the lighting effects when casting spells have vastly improved from the original. You also start off with your little lightening fairy Celest who can hurl lightning bolts at enemies which also look quite impressive when called to aid in battle. The Warrior has the option to move into and become a Berzerker or a holy Crusader, Being a Berzerker allows him to pull off powerful offensive manoeuvres or you take the path of the Crusader where you’ll be granted a fine mix of both offensive and defensive style abilities. Last but not least the Mage who always starts off as the weakest but if used wisely can be one of the most deadliest characters in the game will have the ability to branch off into an illusionist or a spellcaster. Great thing about these classes and new subclasses is that it provides players with a lot of replayability as they can try out what each of the subclasses are like combined with the 16 available skills to choose from. There are a total of approx. 400 items such as weapons, armour, shields, rings, helmets, boots etc. 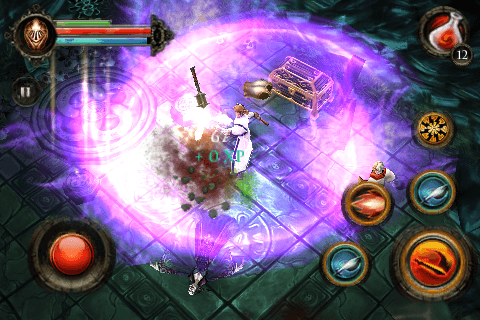 If you’re familiar with the original Dungeon Hunter – picking up loot from killing enemies works pretty much the same way. After you kill a monster or two they will drop random loot, simply walking over it will automatically collect the items and very briefly display the name of what you’ve just picked up on the screen (this I’ve found a little annoying as most of the time you can’t read what you’ve picked up as it disappears too quickly and therefore are forced to go into the menu system and waste time going through what you’ve just collected) most of the time it will be sent straight to transmute (the ability to convert useless and unwanted items into gold for a little less rather than dragging it back to town and selling it merchants for approx. 10-15% more) queue, but on the off occasion rare items will appear which have magical abilities associated to them. These items have magical properties that increase one or more of your character’s attributes. The colour of each item indicates the number of magical properties the item has. For example items white labelled items have no magical properties, Green have 1, Blue have 2, Purple have 3 and Gold have 4. By the end of the game you should be gunning for a character equipped with a whole set of Gold items. The menu system hasn’t changed very much from the original making it very easy to navigate through the stats, inventory, skill, fairy, quest tabs without any problems. Newcomers might find it a little daunting at first due to so many different things you can choose from. Currently the preview code didn’t have a tutorial explaining what each tab does as it did in the original game (we only hope this is added in the final build). A welcomed and much sort after feature that is needed in every RPG is the introduction of the game world map. Dungeon Hunter 2 is approx. 5 times bigger than the original game allowing you to run off in any direction to explore, kill monsters, visit more areas and visit on more side quests. The map will be a great friend to have with you as you embark on this grand adventure. In theory Multiplayer will allow you to either host a game allowing you to begin from any section of main quest that you have already reached and invite your friends in to help you, or join their game and do the same thing. What we have to assume is that you will be able to bring your own character from your single player adventure online where you will hopefully be able to gain experience and collect loot in which you will be able to take back with you and use in your own single player adventure. At this moment in time we won’t be able to find out if there will be any level restrictions when joining a online party. Implementing such a rule will allow for example players with only a 5 level difference to party up together (eg highest level character in group is level 15 meaning you must be min level 10 to join in). Anyone too low will not be allowed to join till they are within level restriction. This will ensure that lower level characters don’t level boost and gain large amount of XP in a matter of hours. Once the full release of Dungeon Hunter 2 is released we’ll be able to provide you with further details on how multiplayer works. For now Gameloft have done an amazing job with opening up the game and allowing more freedom to explore without having to be cooped up in a linear world that was the original Dungeon Hunter. 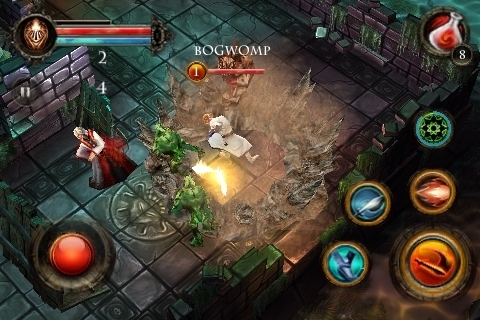 If you’re a true fan of the action RPG – hack and slash style games Dungeon Hunter 2 looks like the best option and a must buy for your iPhone. Keep an eye out for it to hit the iTunes store before Christmas.